I’m a runner. I started running in late 2000, and in June the next year I ran the Mayor’s Marathon in Anchorage, AK—my very first race ever. Since then, I’ve run seven other marathons, a dozen or more half marathons, countless 10 milers, 10Ks, and 5Ks, and even a couple triathlons. In the last 10+ years, I‘ve logged thousands of miles on the road and running has become a big part of my life. 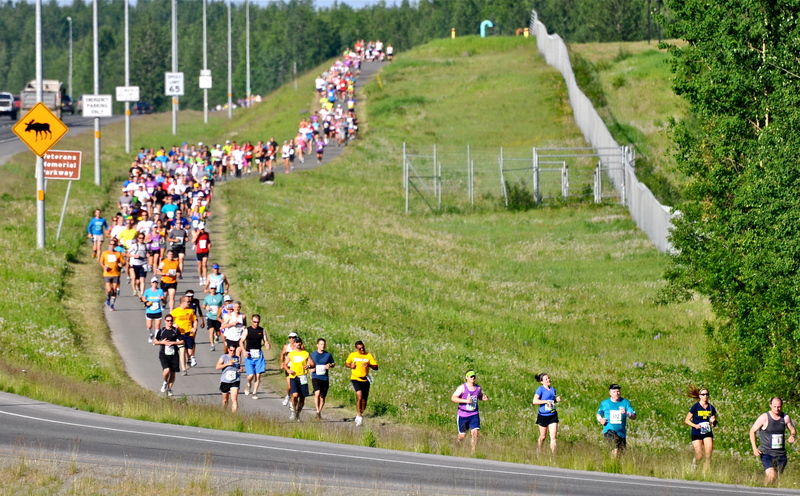 Running the Mayor's Marathon in Anchorage, Alaska. Courtesy photo. The other night I was suiting up for a run and realized that it was 12 years ago to the day that I had started training for my first race. (I have a weird thing for dates and seem to remember a whole host of odd-yet-significant occasions like this one.) I was new to running then, of course, and didn’t know the first thing about what to wear (other than running shoes and even those turned out not to be the right ones for my pronating feet). I can remember wearing cotton sweat pants, long sleeve cotton t-shirts, and fleece jackets to train that winter. When spring came, it was gym shorts, cotton socks, and more cotton t-shirts. I thought back on that—as I pulled on my compression tights and layers of Under Armour—and wondered how in the world I ran mile after mile in cotton. It sticks, it gets heavy, it chafes, and it surely doesn’t breathe when you sweat or, worse, get caught in the rain. Thank goodness I eventually discovered technical clothing that can wick, warm, cool, breathe, or do pretty much anything else the weather and my workout demand! Since I’m not only a runner but also someone who’s interested in innovation, I started thinking more about the gear I wear and use now, and how invention and innovation have impacted the sport of running. There are innovations in shoes, clothing, technology (think GPS and apps that help us map and track runs), even the food and drink we consume before, during, and after a run. Races themselves have become hot spots of innovation, with new timing systems that are built right into the bibs (race numbers), solar powered generators that are used to provide electricity at start and finish lines, and race premiums (like t-shirts) made from recycled and/or sustainable materials. Race number with built-in timing chip. Photo courtesy of MI Sport Online. I polled some friends and members of my local running group to find out what others thought about innovation in running gear and, specifically, what their favorite innovations are (or have been). I received a wide range of responses: tech fabrics like Dri-Fit and Mizuno Breath Thermo, GPS devices, tracking apps, heart rate monitors, shoes (including running sandals and “barefoot” models), special lights for running in the dark, and foods like gels and gummies formulated especially for endurance athletes. At the Lemelson Center, we’re always interested in the people and process behind invention, so I decided to take a closer look at some of these innovations to learn more about who created them, why, and how. I uncovered a lot of great stories. Some, like the invention of the first Nike shoe by college track coach Bill Bowerman, were familiar. But I found some new stories, too, including two female entrepreneurs who have designed a GPS specifically for women athletes, a runner in Oregon who developed a hand-held lighting system for running in the dark, and a former chef who created a plant-based energy bar made of whole, raw ingredients. Nike running shoes with patented waffle sole, about 1979. Smithsonian photo. What I love about all of these stories, both old and new, is that they are wonderful examples of the independent American inventor. These are inventors who began working not in a research lab or a corporation with a big R&D budget (although lots of great innovation takes place there, too), but in their garages, basements, kitchens, and workshops. They were fueled by their own interests, needs, and motivations, and at least initially, all set out simply to solve a problem and to make running easier, more efficient, better. The United States has a rich history of independent invention, and it is great to see this spirit reflected in the running community. Old (left) and new (right) running shoes. As part of my New Year’s resolution to get more organized at home, I was cleaning out my closet the other day and came across the shoes I wore in that first race in Alaska. They’re beaten up and not suitable for running (or really anything) anymore, but I’ve kept them all these years for sentimental reasons. Just pulling them out of the box brought back memories of the training I endured, the anxiety in the days leading up to the race, and most vividly, the elation I felt at crossing the finish line after 26.2 hard miles. They also reminded how far running gear has come: They are so heavy and clunky compared to the shoes I wear now, which—thanks to all the inventors and innovators out there—will probably feel bulky and out-of-date, too, in another 10 years!